Are you over the age of 16 and of Armenian descent? Check out the information below to find out how you could try out for Team Armenia. The 2017 ISBHF World Championships are taking place June 1-10 in the Czech Republic. Please contact Mark Guergis at (705) 794-2871 for more information. A photo of a team ballhockey.com sponsored in front of the old scoreboard from the Barrie Ball Hockey Club that was donated in 2011. The iconic Canadian ball hockey rink at Kandahar Airfield, its boards adorned with faded Maple Leaf flags, has been dismantled. A dozen Canadian embassy staff, including Ambassador Ken Neufeld and a few soldiers, played a final game of shinny last week on the concrete slab in the infield of the airfield’s boardwalk before U.S. army engineers helped take down the boards. A Canadian soldier on his fourth tour in Afghanistan, who asked that his name not be published because of the sensitive nature of his current work, said that “to be part of the ceremony and bring those boards back, it felt like a healthy closing of a chapter. Read the full article on the National Press website complete with photos of the dismantling. It's a March Tradition. Cool Hockey Events' North American Ball Hockey Championships. This year's dates have been announced so it's time to book off March 10-12 (Men's C/D, Novice & Rec, Co-ed A & B.) or March 24-26 (Men's A/B, Women's A/B). The event is expected to sell out by January so get in touch with Jason Kelly today to confirm your team. If you are looking to take a vacation and play a ball hockey tournament all in one wonderful experience; well the 2017 Sun Shine Shoot Out will be taking place in Florida next June (23-25). This event put on by Matt Garry & Pasco County has attracted teams from all over the world to participate over the years. This year, ballhockey.com is encouraging Canadian team reps to consider going down to try their hand at winning it all. If you are interested in representing ballhockey.com Team Canada we can help with jerseys and a portion of the registration fee. Email Mike (ballhockeymike@gmail.com) to have your team considered. For anyone else, this event is always a blast with a beautiful indoor arena and beaches minutes away. The Canadian Ball Hockey Association is very pleased to announce the roster of Men's Team Canada for the 2017 ISBHF World Championship in Pardubice, Czech Republic. General Manager Jeff Dzikowicz along with the input of the high performance director, scout Peter Upper, past coaches and players, as well as the broader ball hockey community, in accordance with the CBHA High Performance model have selected a truly Canadian representative squad with players from six separate provinces. There are a number of returning players as well as an influx of new faces, including two graduates of the U20 program. The coaching was selected with an emphasis on Ball Hockey specific coaching experience with Past Team Canada assistant coach Ian Moores taking the Head Coaching reigns and Ray Cook having served as an assistant coach in for Junior Team Canada and Masters Team Canada and Nick Sbarra who served as an assistant coach for the last two Masters Team Canada teams. Thank you to all these players for their efforts and committment to Team Canada. Bets of luck at the ISBHF World Ball Hockey Championship in the Czech Republic in 2017!! They say the third time is the charm and that was definitely the case for the Midnight Express this past weekend. The Express (ranked #2 in the ballhockey.com Top 25 Ball Hockey Teams in North America) beat the Toronto Orangemen (ranked #10) 7-2 to win the 2016 Bauer Clash of the Titans. The tournament saw 14 of the best teams in North America compete for $14,000 in cash prizes. Over $11,000 of that was up for grabs in the championship final that took place Sunday at the ballhockey.com Athletic Centre in St. Catharines. The Clash of the Titans is recognized as one of the most competitive ball hockey tournaments in the world after its 4th year being played. This year teams travelled in from Pittsburgh, Ottawa, Leominster, Toronto, Barrie, Richmond Hill, Niagara and Welland. As the dust began to settle on Sunday afternoon the quarter finals saw Midnight Express take on the Pittsburgh Gods and Toronto Orangemen take on the Niagara Rebels. Both games were worth watching with teams giving their all in end to end battles. The final game between the Midnight Express and Toronto Orangemen was a lopsided affair. The Offensive of the Express proved to much with goals coming from Matt Tremblantt, Dayton Sopha, JC Gill (x2), JK Gill (x2) & Anthony Loveless. The Orangemen goals were scored by Danny Pacheco & Dylan Steele. Two noticeable absences from the event were the Montreal Red Lite (Ranked #1) & Boston Saints (Ranked #3) but hopes are high that they can participate in the 2017 event taking place December 1-3, 2017. It is expected that the event will again be taking place in St. Catharines but confirmation will come at the end of February 2017. The Midnight Express' winning team was: Frank D’Ambrosio, Sandeep Dhaliwal, Dave Digiornimo, Gurjeet Gill, Jaisen Gill, JC Gill, JK Gill, Shawn Hannon, Bobby Housser, Nicholas Laboni, Anthony Loveless, Marcel Mallais, Tyler McPherson, James Metis, Toby Monteiro, Fred Perrera, Mike Porter, Jacob Robitaille, Dayton Sopha, Matt Tremblatt, Chris Vegenas & Ben Vantullo (G). You can watch the championship game in its entirely thanks to our partner WeeStreem who covered all the playoff games on Sunday providing live HD video streaming online! 2016 Clash of the Titans presented by Bauer & BallHockey.com 14 of the top ball hockey teams in North America compete for $14,000 in cash! (1st=60%, 2nd=20%, 3rd&4th=10%) 100% of the $ 1,000 entry fee is returned in the prize pool to the teams. Sunday, November 27, 2016 BallHockey.com Athletic Centre 16 Melbourne Ave. There are just 11 days remaining until the kick off of the 2017 Bauer Clash of the Titans. We've released the names of the 14 teams competing this year... and now we are excited to bring the schedule to you! You can download a copy by clicking here (.pdf). This year our partner WeeStreem will be streaming all games taking place on Sunday at the ballhockey.com Athletic Centre (including Semi Finals & Finals) live on ballhockey.com. In anticipation of the event ballhockey.com President Brian Broley made the following statement to teams. "Ken Cashman of Bauer and I are pleased to invite you and all the players to the Niagara Region for some great competition and hospitality. With $ 14,000 on the line in prize money, this will be the fourth year of this event and we are excited to have your commitment and participation to the sport at the highest level. Players are coming from many regions of North America and it is a great opportunity to measure up against some of the best players in the game. Last year we saw The Rebels win their second title and Midnight Express hit their second consecutive final game, but the story of the weekend last year was watching the Niagara Monarch’s go 3-0 as the 14th seed and run into the semi-finals and the cash on Sunday. That is why they play the games, and I will be excited to see some of the new teams this year step up their performance against the best of the best,"
Last week we announced the first 7 teams that will be participating in the Clash of the Titans this year. With just 14 days until the ball drops ballhockey.com is excited to announce the remaining 7 teams that will be competing this year. There is $14,000 in cash up for grabs at this years tournament which takes place November 25-27 at the ballhockey.com Athletic Centre in St. Catharines. 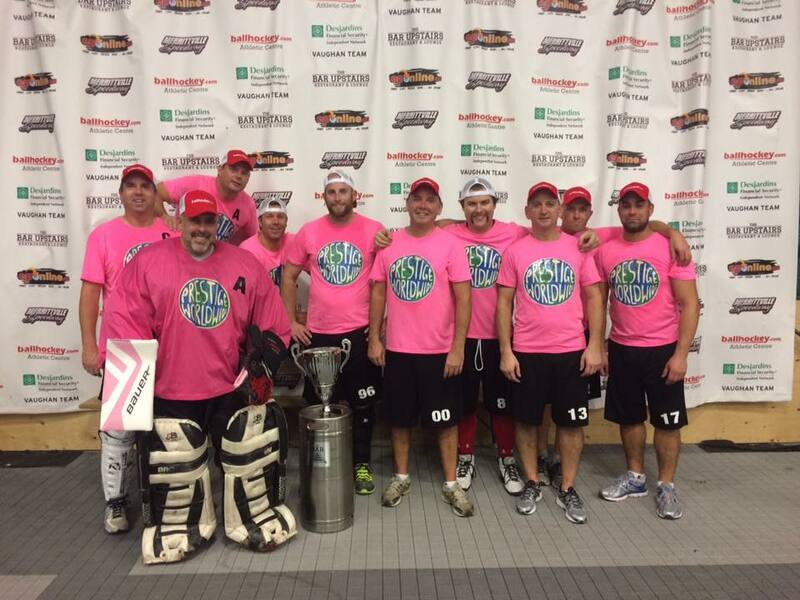 - Ontario Ball Hockey Association Tier 3 Eastern Regional Champions in 2015. This event is free to the public to watch and will be taking place at the ballhockey.com Athletic Centre in St. Catharines (16 Melbourne Ave.). For fans who cannot make it to the rink ballhockey.com will be offering live streaming of games (details and schedule will be announced on Monday). With just 22 days until the start of the Bauer Clash of the Titans ballhockey.com is excited to announce the first 7 teams that will be competing. This years tournament will see 14 of the top ball hockey teams in North America competing for $14,000 in cash over the three day event. This event is free to the public to watch and will be taking place at the ballhockey.com Athletic Centre in St. Catharines. For fans who cannot make it to the rink ballhockey.com will be offering live streaming of games (details and schedule still to be announced). In case you missed last years Clash you can watch the championship game below on our youtube channel. "On behalf of everyone at Catalyst, we want to thank everyone who participated in and supported the 6th Annual New England Ball Hockey Classic presented by Bauer Hockey, Inc. this past weekend. Breakaway Hockey Dek & Sports and Casey Corcoran, with the help ofAllen Pereira, provided us with an outstanding venue, and support staff, for our event. If you haven't had the opportunity to play at their venue, you are missing out. These guys know and love our sport. Our refs and scorekeeper did an outstanding job all weekend. No one has a more difficult time during any street hockey tournament than the officials. They are scrutinized and their calls are never satisfactory. This is not unique to our events, but all street hockey events. We thank our refs for their patience and efforts. Almost every game this weekend was close and competitive. Sunday afternoon was electric. The final 3 A games and the Rec final was nothing short of outstanding, up and down hockey. We hope to be able to continue to grow our elite A tournament next year by adding more out of state teams. We certainly hope the Ottawa Godfathers have made it out of MA, as no team enjoys themselves more during hockey weekends (as it should be). Huge thanks to Buffalo Killer B's and Sting for making the journey down. We know they were shorthanded, but it means a lot to us that their organizer and leader Robert Chassin got a chance to see how far we have come since our 2nd year, when he last came down. We think it's safe to say the Leominster Rams are back to competing for major tournament titles with a solid core that isn't going anywhere. The RI Rage will only continue to get better and had a strong showing this weekend. The Leominster Jets aren't dead yet, and Dracut Breakaway Best showed they can not only compete with other A teams, but win. Our Rec teams were top notch, each team truly had a chance to win the whole thing. Congrats to the Millcity Hitmen Hockey on winning the Rec Title. Great weekend for them and they deserved it. Lastly, if you were at the rink Sunday afternoon for the Leominster Americans and Boston Saints game, you saw how great our sport can be. Up and down, physical action at its best. This rivalry has been going on for 3 years now, with both teams claiming victories and titles. Highlight real goals, dozens of blocked shots, hits, fights and spontaneous celebrations. If you have not seen these two teams play, you are missing out. Get to a tournament and see them battle. See everyone next year for our A & Rec, where we hope to continue the tradition of elite hockey. Next up for us is the 3 on 3 National Championship presented by BAUER Hockey Inc. More information will be released in the coming days and weeks but contact us ASAP as we expect this event to sell out. Keep in mind we are running 5 divisions, plenty of opportunity for everyone to participate. Leominster Dek Hockey Can-Ams, Ballhockey.com Clash of the Titans,Cool Hockey Events Holiday Bash, Breakaway Hockey Dek & SportsHangover Tournament, and George Tarantino Jr. 's Super Bowl Bye Week Tournament are all upon us. We hope everyone can make it to one or two of these great events.